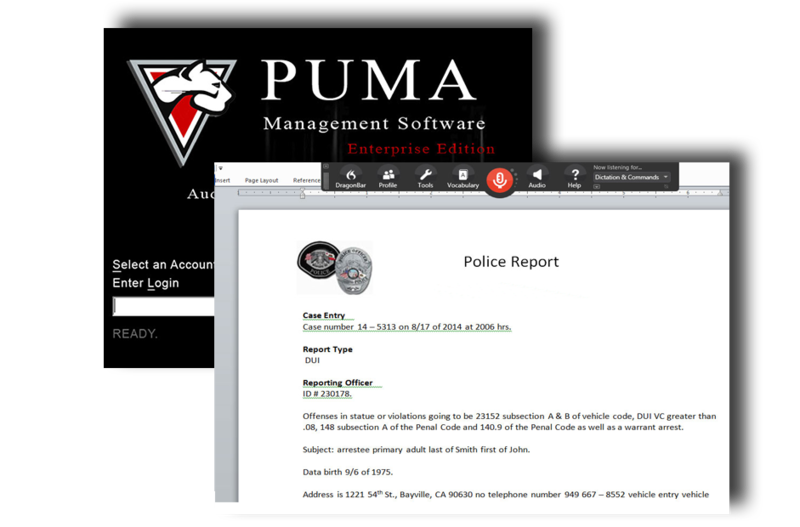 With the PUMA-5 and Speech Recognition Solution, you’ll fast track report generation, minimize paperwork and optimize officers productivity! Speech recognition increases productivity by providing your Officers with a faster, easier way to complete Incident Reports. By helping your officers get through the stacks of paperwork more quickly, you’ll not only reduce time spent on incident reporting, but you can get them back to the critical business of protecting your community. Speech recognition enables officers the ability to dictate feld reports without ever touching a keyboard or taking their eyes off their surroundings. The use of the PUMA-5 Digital Audio Recorder now provides a mobile dictation and contact solution which is fully integrated into the speech recognition solution. This promises to save time and money throughout Investigations, Patrol and/or Traffic Divisions. The PUMA-5 and Speech Recognition Software is the ideal solution for busy public safety officers who want to work faster and more efficient. Officers can dictate narratives, full incident reports or even emails. All at speeds three times faster than most can type and with 99% accuracy. Workflow is key to the success of Speech Recognition. This is why Versatile Information Products offers a multitude of options for Front-End Speech Recognition, Back-End Speech Recognition or a hybrid of the two. Officers can also dictate into a digital voice recorder such as a PUMA 5 Digital Recorder for automatic transcription when they connect to their PC. Either way, Philips SR software turns talk into text 2x to 3x faster than typing. With Philips Specexec SR, officers can complete paperwork with unprecedented speed and ease so they have more time to focus on the most important aspects of law enforcement. A police officer’s first order of business is to serve and protect—whether they are on the move serving the community or fulfilling administrative tasks at the office. Police officers spend their day outside protecting the public’s safety, and most people don’t realize they also spend a significant amount of time in the office. At the office, they are responsible for organizing documentation for court cases, filling out paper work and providing testimonies in court. Therefore, productivity and efficiency is paramount to law enforcement officers, and document turnaround can be a challenge. By leveraging voice technology, officers can significantly streamline workflow processes and focus on their job—protecting their community. PUMA, a handheld Philips digital dictation voice recorder specifically designed for police and sheriff departments, can be used by officers to record interviews and create incident reports. Accurate documentation of a case is extremely important and the PUMA’s high audio quality can help to ensure no information is misconstrued. Accurate reports enable fewer follow up questions and improve response times. 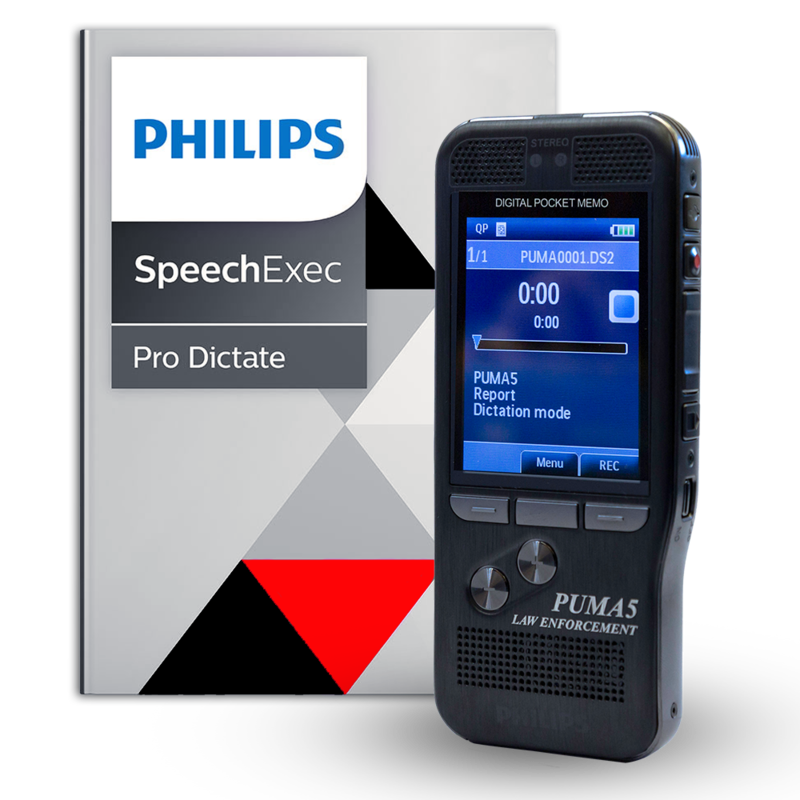 The PUMA product is fully integrated with the Philips SpeechExec Pro software including professional speech recognition. After the dictations are complete, officers can securely transfer their recordings to the software where either speech recognition can create a first document draft or office staff can easily identify and access the files for further processing. Speech recognition is extremely helpful, because documents are created in the background while officers can keep working on other reports and tasks at hand. At the close of their shift more reports will be ready for review and archiving. Philips SpeechExec Pro with speech recognition enables greater productivity and it also helps reduce overtime hours and protects information security. The time saving achieved due to the use of PUMA device and SpeechExec Pro with speech recognition about 2x to 3x what would take the officer to type his or her own report.